Just in time for the unofficial start of the summer season this holiday weekend, Heal the Bay, a water quality watchdog from Los Angeles, recently released its annual report cards for the beaches of the West Coast. Crunching numbers compiled throughout the year by various public health agencies’ weekly water tests and gathering information from assorted other agencies and outfits, Heal the Bay delivered grades on the traditional A to F scale for beaches and counties throughout California, Washington, and Oregon. According to this year’s report, Santa Barbara County enjoyed generally good results with a few glaring exceptions. 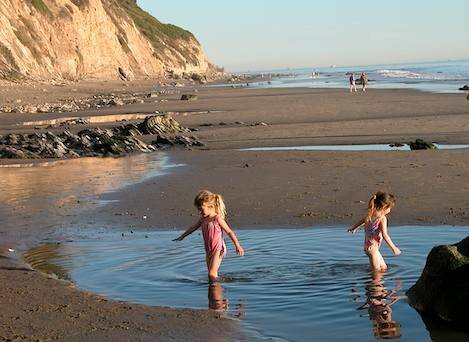 In the very bad news department, the often pollution-plagued stretch of coast off Arroyo Burro Beach (aka Hendry’s Beach) got an F during both the wet and dry seasons last year, earning the popular beach the dubious distinction of being one of the 10 worst beaches in the state according to Heal the Bay. Heal the Bay breaks its grading into two distinct categories: the summer “dry” months when the state mandates such testing (April through October) and the “wet” months (November through March) when the testing is often carried out by local watchdogs such as Santa Barbara Channelkeeper and various city municipalities. During the “dry” months, Santa Barbara County’s Environmental Health Agency carried out weekly tests of 16 different beaches between Guadalupe Dunes to the north and Carpinteria State Beach to the south. With industry standard indicator bacteria tests (which, it is important to note, do not test for actual pathogens) typically taken a short distance north or south of a storm drain or a creek mouth, the “dry” months saw virtually every beach in our area score either an A or a B, save for F grades at Hendry’s, East Beach at Mission Creek, and the creek at Jalama County Park. During the “wet” months, when Channelkeeper and the City of Santa Barbara carried out the tests using essentially the same methods, the As and Bs dropped off significantly with most beaches scoring Cs and Fs for Hendry’s, East Beach at Mission Creek, East Beach at Sycamore Creek, Hope Ranch Beach, and Carpinteria State Beach at Carpinteria Creek. Also of note, in an overall sense, the results for this past year show a decrease in water quality for beaches in Santa Barbara County when compared to the the seven-year average. “Basically, what we see [in the Heal the Bay report] is in line with all the problems we have been seeing and talking about for the past couple of years,” summed up Ben Pitterle, Channelkeeper’s director of watershed programs. What Pitterle is talking about is the fact that Hendry’s and East Beach specifically have had less than stellar test results more times than not in the past five years. And while the various city and county agencies have worked diligently alongside groups like Channelkeeper and Heal the Ocean to figure out the specific source of the poor marks, the general consensus remains that a wide variety of sources are to be blamed, such as leaky sewer pipes (both private and public), higher than average rainfalls, people pooping up-creek, and illegal RV dumping. Then there is also the basic fact pointed out by Cameron Benson, manager of Santa Barbara’s Creeks Division, that these areas are “urban creeks” and, as such, every type of litter or pollution you see in the neighborhoods around them typically winds up making its way to the water untreated, thus tipping the scales of weekly testing toward poor results. “Really, one of the things this shows us is that we all need to be more vigilant about keeping these places pollution free,” said Benson. For Heal the Bay’s complete report on all West Coast beaches go here.